Once again, the Labor Day holiday is here. As we enjoy some weekend time with friends and family, we should all appreciate having such weekends. In Maine and across this nation we can be thankful that Frances Perkins and workers unions fought to earn us workplace safety rules, a 40-hour workweek, a minimum wage and Social Security to protect us from destitution after our working years. 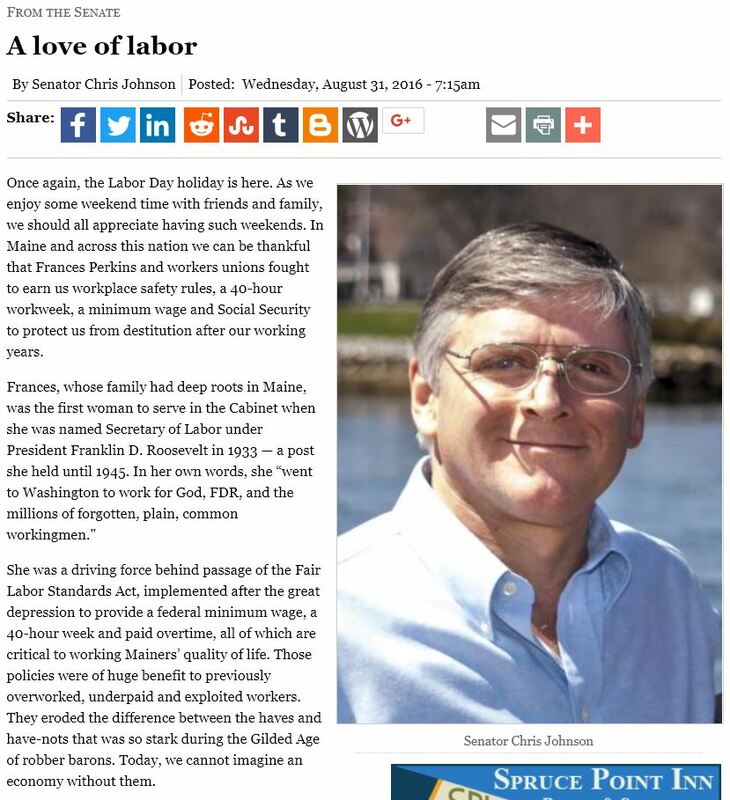 She was a driving force behind passage of the Fair Labor Standards Act, implemented after the great depression to provide a federal minimum wage, a 40-hour week and paid overtime, all of which are critical to working Mainers’ quality of life. Those policies were of huge benefit to previously overworked, underpaid and exploited workers. They eroded the difference between the haves and have-nots that was so stark during the Gilded Age of robber barons. Today, we cannot imagine an economy without them. Social Security, for which Frances Perkins also fought, is the single greatest anti-poverty protection for American seniors. Today, roughly 15 percent of Americans older than 65 live in poverty. That’s a shame, but without Social Security, estimates say roughly half of all our elders would be destitute. Frances, along with the workers and unions who have fought for economic justice, have helped countless Americans live better lives. But the middle class — made up of those plain, common working people that Frances went to Washington to support — is struggling today in Maine to pay the bills, to fend off financial ruin and to provide a future for our children. About half of Mainers today say they couldn’t come up with the money to cover an emergency expense; Those people, our neighbors, are one sudden sickness or unexpected car repair away from falling behind. Meanwhile, billionaires, big corporations and the lobbyists they employ have been steadily creating advantages for themselves and undermining the average worker’s opportunity to make a decent living. The difference between haves and have-nots is once again widening. In the 1970s, CEOs made 20 to 30 times more than the average American worker. Since then, that ratio has ballooned. According to The Economic Policy Institute, today’s CEOs make 276 times the wage of typical workers. Most Americans still have yet to recover from the Great Recession, even though that downturn ended seven years ago, as documented by the Portland Press Herald recently. It tells how the average income for the 99 percent is still lower than it was back in 1998 after adjusting for inflation. Meanwhile, incomes for the executives, bankers, hedge fund managers, entertainers and doctors who make up the top 1 percent have steadily improved. These one-percenters account for roughly 22 percent of all personal income, more than double the post-World War II era level of roughly 10 percent. One reason the income disparity is troubling for the nation is that it’s thinning out the ranks of the middle class. Working class people have been under attack economically for decades. But nobody who works full-time should find themselves among the downtrodden, as too many Mainers do. 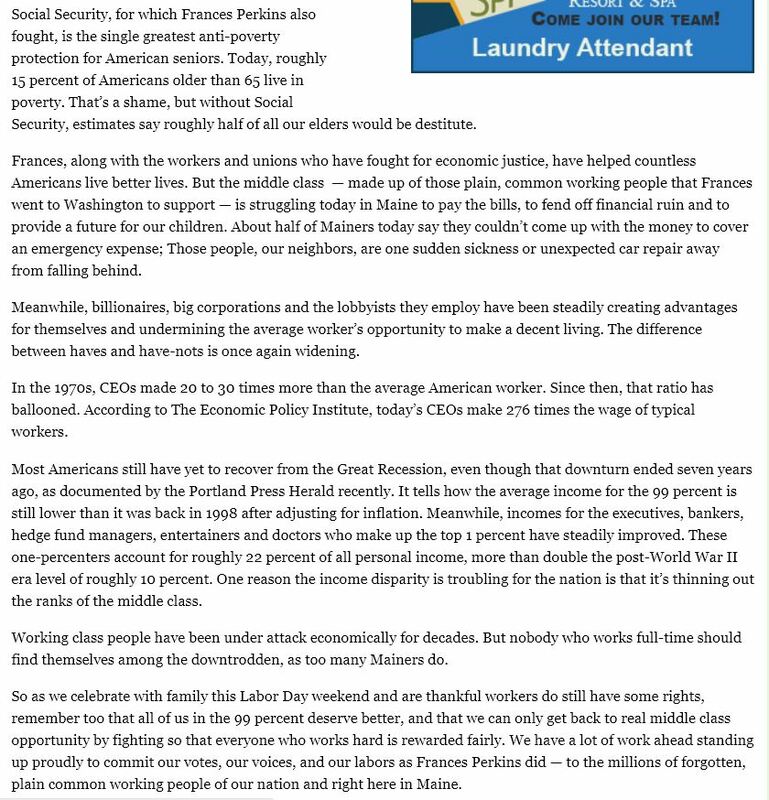 So as we celebrate with family this Labor Day weekend and are thankful workers do still have some rights, remember too that all of us in the 99 percent deserve better, and that we can only get back to real middle class opportunity by fighting so that everyone who works hard is rewarded fairly. We have a lot of work ahead standing up proudly to commit our votes, our voices, and our labors as Frances Perkins did — to the millions of forgotten, plain common working people of our nation and right here in Maine.